Dimensions: L79" x D19" x H19"
There are no other TV stands like this one with so much work and design all over the skilfully constructed wall unit. 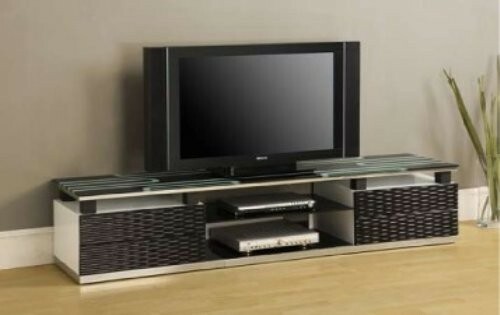 It offers thick two tone black and clear tempered glass top that has plenty of space for your TV and other accessories, four wicker pattern style wood drawers and two shelves for additional video equipment. Bottom is accented with the silver metallic which matches perfectly with the white sides, take a closer look to see everything it has to offer.